Downtown San Diego is in the heart of the city, but this doesn’t mean everything is made out of concrete and metal. San Diego is known for having beautiful green spaces where residents can relax and enjoy the wonderful weather of Southern California. There are plenty of great parks to choose from, but these five choices regularly top lists of San Diego’s best parks due to their vibrant atmospheres and fascinating installations. This adorable park is right in the Marina district of downtown. It has some impressively large patches of grass where people can soak up the sun or run around, and there are also some lovely shade trees to sit under. Pantoja Park is nice and roomy, so it’s great for throwing around Frisbees or kicking a soccer ball. This park is dog friendly and situated near several restaurants where you can have an outdoor lunch. Located in nearby Coronado, Tidelands is perfectly situated to get warm sun and a cooling ocean breeze. There’s a skate park as well as a playground for the kids. Plenty of public facilities, such as bathrooms, free parking, and trails, let you stay at the park for hours. Tweet Street Park is a favorite for families because it’s extremely child friendly. This lovely little park is within walking distance of many downtown San Diego lofts, condos, and other family homes in Cortez Hill, and the spacious lot with two-hour parking lets you easily visit if you live farther away. Play areas at the park include slides, rock climbing walls, and swings, and there are grassy areas for picnics. Pets are allowed in the park as long as they stay leashed, so everyone in the family can enjoy the park. As the name implies, this park in Coronado is famous for its view of the bay. When you walk along the edge of the park, you can see across the bay to get a great look at the skyline. The park itself has some nice floral beds, trees, and shrubs along with trails to walk on. There isn’t a lot of seating, but it’s a great place to spread out a blanket and just relax and enjoy the outdoors. Bayview Park tends to be a local secret, so it’s usually very quiet. No other park downtown can beat Balboa Park simply because it’s so large and vibrant. This huge green space is almost as big as all of downtown itself, and it’s filled with ancient trees, grassy lawns, and lovely flowers. 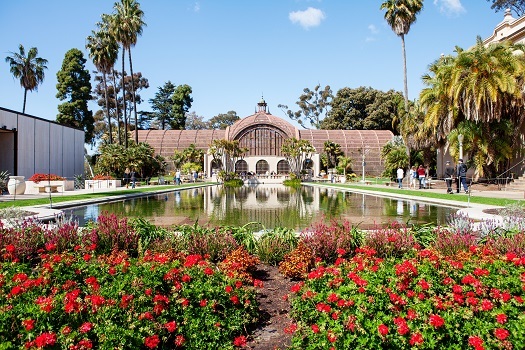 In addition to its traditional green spaces, Balboa Park also has many museums and other cultural places. Check out a concert at the Hunte Amphitheater, view classic art in the San Diego Art Museum, or stroll through the peaceful Japanese Friendship Garden. San Diego has a wealth of fantastic choices when it comes to parks, which is only one reason to consider investing in downtown San Diego real estate. If you’re ready to find your perfect home in the downtown district of America’s Finest City, call on the professionals at 92101 Urban Living to assist you in your search. Give one of our friendly agents a call today at 619-649-0368.